Parks’ number 8 scent, Fue de Bois, is instantly charming. It is bold, distinctive and earthy, yet gentle and attractive at the same time. We call this unique combination of birch, oakmoss and cedarwood, spiced with unmistakable hints of patchouli, Fue de Bois, which means ‘wood fire’. 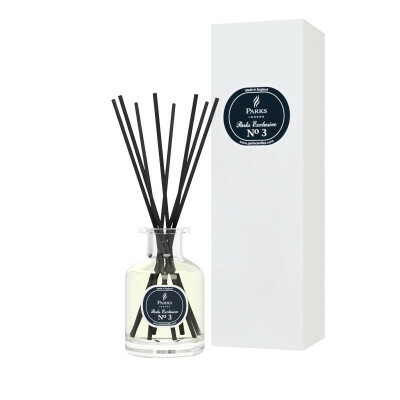 This is a complete reed diffuser kit and so it includes everything that you need to completely change the atmosphere of your home or office, including a supply of our unique Fue de Bios scent that is sufficient for 6-8 weeks of continual use. 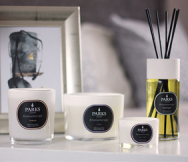 It comes in a decorative glass vessel that is as much a display piece as a storage container, and a set of reed diffuser wands that help to distribute the powerfully herbal, resinous scent without adding – or subtracting – a single note from its symphony. There are really 2 components to our number 8 scent. The most striking is the Fue de Bois combination of cedar, oakmoss and birch. These scents are derived from natural ingredients that have been carefully harvested to every organic standard, and then handcrafted into scents that grace this surprisingly complex creation. All of this is offset by a bright, vibrant counterpoint of patchouli. This also provides a woody scent that is derived from the green leaves of the Pogostemon cablin bush, which is closely related to mint. This diffuser set comes in a lovely gift box that is perfect for presentation, but can also easily be wrapped to keep it a surprise.